Growing cacti from seed is a little more difficult, and requires a little more patience than many other kinds of seeds. They require a special sandy and high drainage soil and a lot of patience. Some seeds take 6 months to a year to germinate. If you are patient and diligent, you will have a cactus that will be a part of your family for years and years. Prepare your soil. Cacti prefer sandy soil with really good drainage. Use a mix that is roughly half potting soil and half coarse sand. You can buy commercial, premixed cactus mix, or make your own mix. There are dozens of cactus mix recipes out there, and you may want to do a little trial and error until you find a mix your cacti like. The mix should be lightly moist, but not wet. Fill each seedling cup to the top with your moist cactus mix. Sprinkle 1 to 3 seeds in the middle of the cups. Do not cover it with dirt. Instead, cover it very lightly with a thin coating of the coarse sand. Place each cup in the watering tray, and pour about 1-inch of water into the tray. It is best to bottom water the seedlings, as top watering can displace the seeds. When the cups appear moist on top, but not soaking wet, move them from the tray to the mini greenhouse. You can make a mini greenhouse out of a clean plastic food container with a lid, or you can buy a mini greenhouse from a garden supply store. Place the greenhouse in a warm place, out of direct sunlight. Cacti need more moisture and humidity that you would expect in order to germinate. If you see too much condensation on the lid of your greenhouse, you need more air flow. Prop the lid open a little. This will prevent mold and help your fragile seedling. Be patient! Some seeds take 6 months to a year to germinate! Just keep the soil evenly moist, watering whenever the top of the soil dries. This is about weekly here. Eventually, you will see a tiny little cacti pop out of the soil. Keep this out of direct sunlight, as it can cause the cactus to burn. 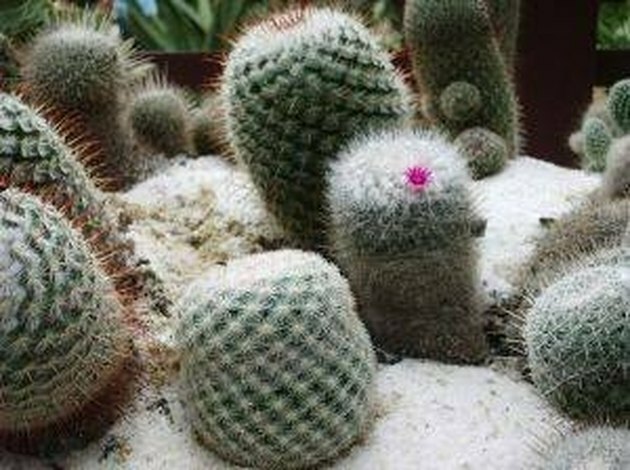 Mature cacti can tolerate direct sunlight, but the babies cannot. Keep in mind that cacti are very slow growing plants. The small cacti you buy in the stores are usually about 5 years old! Re-pot the cactus in the spring to a small pot that is about one inch bigger in diameter than the cactus. Re-pot each spring as the cactus grows.